I’ve been really bad at updating my BLOG this week. It’s been an abnormally busy week. Friday was supposed to be my 8 mile run day but I had to attend that my son’s 4.0 Principles Honor Roll ceremony and then take him on an overnight Cub Scout camping trip; overnight turned out 2:30AM. I was awaken by the sound of my eight year old son moaning and then vomiting in our tent. Since I normally don’t keep plastic bags in the tent I was quick to grab a sleeping bag storage bag to catch multiple upchucks of putrid chunky goodness. Only problem therein is that the bag is made of nylon and proved to be an excellent filter, keeping the large particles and allowing the now strained liquid to drain out onto the tent floor. He loves camping out and comradery of the pack, so when I asked him if he wanted to go home; which is only 20 minutes from the campsite, I was not surprised when he said no. After the fourth bout he threw in the towel as he wanted to feel better and be in his mommy’s arms at home. He seemed to sleep well when we were home, so I was thinking that he perhaps had eaten one too many S’mores which led to his expulsion of partially digested dinner and snacks. I decided to wait until he got up in the morning before returning to the camp ground to retrieve our camping gear in hopes that he would feel better and want to return for the scouting activities. Sadly, he wasn’t feeling up to it so I left for the camp site. By the time I arrived at the camp site it was around 9:10AM the sun was shining and warm, plenty of time for the gooey contents in the tent to ferment. I do love cleaning warm putrid tents in the sun. So how is your day coming? 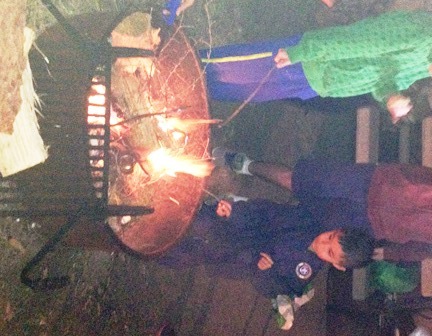 This entry was posted in camping, CUB Scouts and tagged BSA, California, Camping, Cub Scouts, Kids, San Diego, S’mores. Bookmark the permalink. Hope you got it hosed off before the smell set in….